Now that I have resumed my F1 2010 story (finally! ), let me talk about my time with the game outside of that role-playing experience. Ever since finishing my first season for that narrative, I’ve been playing the game intermittently in things like its time trials, online and, recently, in the game’s career mode. I originally did this to mess around while I contemplated how I would approach my second season but as I realised it would be a while before that could commence, I did it to just enjoy the game for what it was: a racing game focused on Formula 1, and its 2010 season. Doing so was interesting for a variety of reasons. First of all, playing it online was insightful because of what that actually entailed, as well as observing how people respond to that. Being a simulation game centered on a real life sport, it is easy to assume that those who are playing it would understand the need to actually use the brakes on their cars, or to pit when their tires are degrading and they are losing grip. Being a racing game, however, it’s also easy to assume that its players would ignore such rules and just focus on going as fast as possible, no matter what. Intriguingly, both ended up being true. Those playing F1 2010 online did brake for corners, allowed for a loss of grip or damage on their cars and, for the most part, raced as you would expect them to in such an environment, but they also used the people in front as aid in their braking (causing collisions) and, if they weren’t winning or if it was clear that they weren’t going to be able to, they quit the race, just like in any other game. As someone who wanted to play a game about Formula 1 against (or perhaps with) people with a like-minded interest, this latter behaviour was frustrating -- particularly as I did have some level of expectation that things would be different with F1 2010, given the game’s context. But as someone who is passionate about the medium overall and thus, how players approach their games and the responses they can have to them, I found it fascinating that they weren’t just engaging with the actual rules of the game (or sport), but they were trying to use them to enjoy themselves as well… until they realised they weren’t going to win and it was time to quit. Such behaviour is, I’d say, different to how players approach a multiplayer FPS or even other racing games, and was definitely something I pondered after every race I did (and do) successfully manage to have. 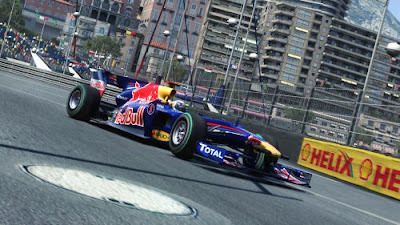 The online multiplayer space in general is still an ambiguous, mysterious place that definitely needs more exploration and certainly doesn’t get anywhere near as much critical attention as it should, so considering that alongside the circumstances I would find myself in with F1 2010 online was absolutely an enlightening experience. I’d be lying, however, if I didn’t say that I wish people could just race properly for a change and actually embrace a game’s full breadth of rules, rather than just the ones that please them. I can dream, I guess. Secondly, playing F1 2010 as a player (rather than fulfilling the role I inhabit during my story) has been interesting because it means that I can think about it in the context of it being a racing game, rather than a Formula 1 game. What that means is that, like the various other games I cover with my Behind The Wheel series, I can approach F1 2010 with a more analytical eye and think about it in a critical context, as opposed to just an entertainment one. The results of this are incoming, but in the meantime I have found it interesting because, as I alluded to back when I was anticipating it, it’s the first Formula 1 game I have played in a long time. Comparing it to my previous experiences with really old F1 games has been interesting but also, perhaps, a little unfair given the length of time between them. That has made it somewhat hard to approach because there’s no benchmark or fair comparison to hold it up against -- aside from other racing sims such as Forza or Gran Turismo, which deal with different subject matter -- but even so it has been insightful trying to understand what F1 2010 is, and what it brings to the table. There’s no denying that I was pretty enamoured (and still am) with the game when I offered my brief impressions of it, and while I consider it to be a separate entity, my Living The Life story would also imply to anyone who reads it that the game is something that I am very fond of. Discovering precisely why that is has been good fun, and I look forward to elaborating on and explaining it to you in the near future. Lastly, I have found it fascinating seeing how I have approached things like races in the career mode, outside of the context of my story. When I’m role-playing for that, I’m acting as a proper F1 driver and conveying what that reveals in a story format. Playing it as a player, on the other hand, has revealed that regardless of context, I still approach it as -- yep, you guessed it -- a driver. In other words, I’m still thinking about nailing every single corner, using every single inch of a circuit and driving to the utmost of my ability even though it’s all somewhat unnecessary, because I’m not doing it for a specific purpose. I’m not trying to create a compelling story or to achieve something like a fast lap time (not always, at least, on that last point) while playing as a player, so why do I still treat it like I’m a driver rather than someone who is pressing buttons on a controller? Pondering that question has been extremely interesting given my history with the racing genre, my passion for racing in general (games or real life) and, indeed, the different ways in which I approach the different games I play. But while I don’t know the answer to it just yet, I can say that it is absolutely not surprising that I act in this way. When I’m playing a simulation game, where real tracks are involved and, in F1 2010’s case, real drivers and real life rules play a significant part, I engage that experience through my understanding of it and what it does (or should) entail given its subject matter. I know that the infamous hairpin at Monaco or Eau Rouge at Spa are real corners, that require real consideration (in terms of how to take them, speeds that they allow, how a car should behave whilst driving through them, etc.) and, as a result, my inclination is to treat them as such rather than the virtual reproductions they actually are. As a result, getting them right and doing so consistently is crucial, to me, and when I’m not doing that or at the very least trying to, then I’m not -- in my eyes -- playing the game(s) properly and therefore not having what I deem to be the intended experience. Recognising this because of playing F1 2010 for fun has been wonderful, and I’m glad that the game has been able to open my eyes up, yet again, to something that I was oblivious to previously. 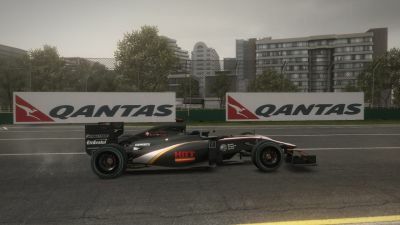 It sounds strange: F1 2010 has given me so much and allowed me to understand far more about the genre, myself and what racing games can provide, and yet for the majority of people who play it they would only see a game that’s focused on Formula 1. Like other sports games or, indeed, other titles that focus their attention on one thing, F1 2010 to most people wouldn’t be anything more than enjoying that particular subject should it interest them, but to me it has been a great learning experience; a fantastic racing game; and an opportunity to celebrate and revel in some of the things that I absolutely love. What I have discussed above is just a small example of the impact it has had on me and my thoughts; what I’m yet to communicate might just be, perhaps, even more interesting. Stay tuned to see if I’m right.